FNO members during the press briefing. The Federation of National Organisations (FNO) requested President Maithripala Sirisena to dissolve Parliament and form a new government with a fresh mandate, to eliminate the prevailing unstable situation in the country. Addressing the media in Colombo, yesterday, the federation commended the decision taken by the President to appoint a new Prime Minister, saying that it was constitutional and legal. FNO Convener Dr. Gunadasa Amarasekara said if President Sirisena had not taken that decision, the country would have faced a grave situation. He said the only solution to the present crisis on the country’s political arena was to dissolve Parliament and let the nation decide on a new government. Attorney-at-Law Kalyananda Thiranagama said the decision was taken by the President at a decisive moment. Referring to the powers vested with the President by the Constitution with regard to the dissolution of Parliament, he said there were three clauses in the Constitution; Clause 33(2), 62(2), and 70 (1); where the President had been vested with the powers to dissolve the legislature. He said that the 19th Amendment to the Constitution did not affect that power. Foreign News Analyst and Critic Mohan Samaranayake said that certain supporters of the Good Governance Government were attempting to exaggerate the present situation as a crisis, adding that it was not so in reality. One such group was the Janatha Vimukthi Peramuna, he said. It was their contract to support the government while being on the outside. Several civil society organisations were doing the same, he said. Samaranayake also criticised certain Members of Parliament and therefore, highlighted the need of the hour to go for an election. 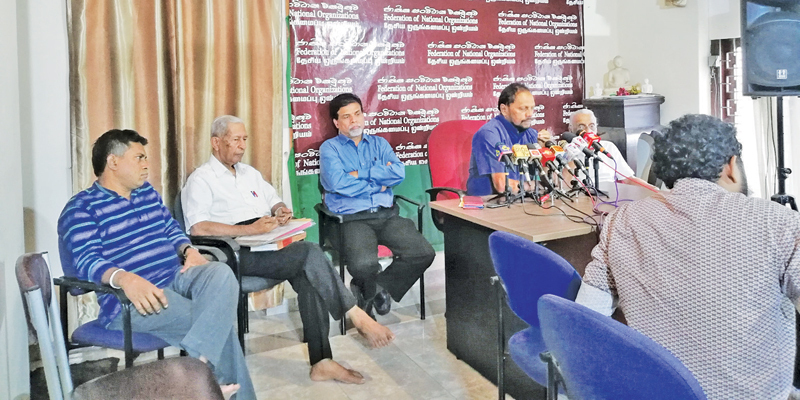 Patriotic National Movement Secretary Dr. Wasantha Bandara said that it was not a constitutional crisis in the present political situation of the country, but a political one. However, he said, the decision taken by President Sirisena would be a significant juncture in the political history of the country. He told the media that the Foreign Affairs Minister of the new government had so far failed to explain and appraise the diplomatic delegations within the country regarding the series of political changes that took place during the recent past.